Ever dream about being on top of the world? One Enterprise employee made this a reality when he decided to take on Mount Everest, the world’s tallest mountain with a peak of 29,029 feet (5.5 miles) above sea level. 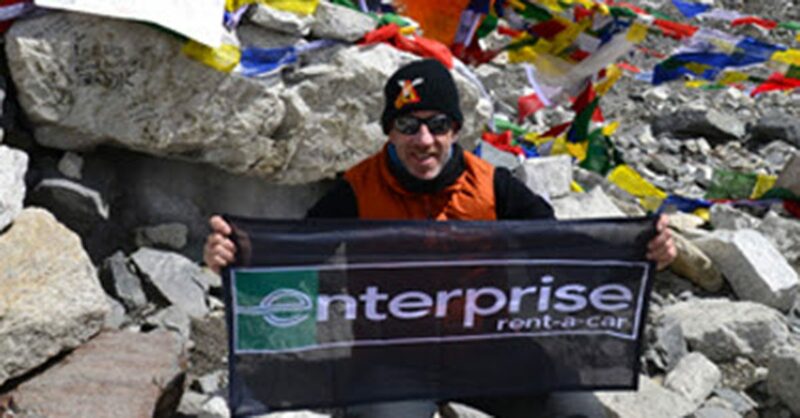 Pedro G., Enterprise Holdings’ Group Operations Manager for Spain, spent 14 days trekking up the Himalayas in Nepal last month to fulfill his lifelong dream. With gear in tow, Pedro, his guide and five other hikers spent eight days making their way to the Everest base camp, which sits at 5,340 meters above sea level. Those moments of tranquility kept Pedro going as treks through the Cho La pass brought on more physical and mental challenges. Some days Pedro and his group would walk only six hours and other days they’d log more than 12, always careful to allow their bodies to acclimate to the altitude and to continually hydrate. The other challenge is the frigid temperatures. Anything exposed freezes quickly.